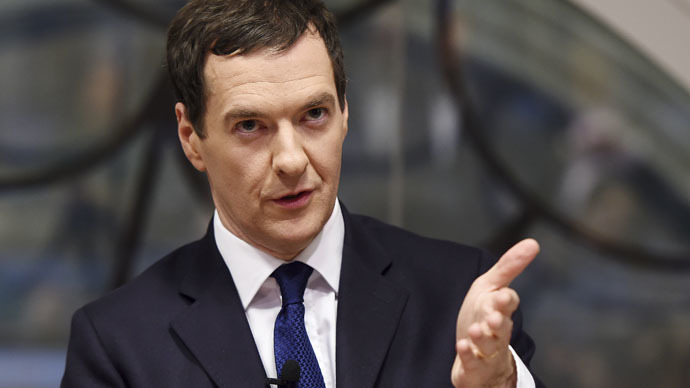 UK Chancellor George Osborne has warned there is a growing risk of a “very bad outcome” between Greece and the Eurozone. Meanwhile, anti-austerity activists have called two “emergency” solidarity protests in London to support the Greek government. “It’s clear that the risks to the world economy, the risk to the British economy of this standoff between the euro zone and Greece, is growing each day,” Osborne said in an interview with Bloomberg TV in Istanbul on Monday. He cautioned that a potential Grexit – a Greek exit from the Eurozone – could potentially cause serious damage to the UK as well as the global economy. Prime Minister David Cameron held an emergency Cobra meeting with senior Treasury and Bank of England officials on Monday to discuss contingency plans for the UK should Greece make an exit. Odds offered by bookmaker Paddy Power suggest the chance of a Grexit by the end of 2018 had risen from 3/1 last week to 5/4 on Monday. Ahead of the G20 meeting of finance ministers in Istanbul, Osborne and US Treasury secretary Jack Lew co-authored an article in the Wall Street Journal, calling for a G20 “Growth Plan,” including reform, free trade, and credible fiscal planning and monetary measures. “In an uncertain world there is once again an urgent need for international coordination to confront problems, contain risks and deliver a comprehensive plan for strong, sustainable and balanced growth,” Osborne and Lew wrote. Eurozone finance ministers will meet in Brussels on Wednesday for a crisis meeting to discuss Greece. The Greek government is set to propose a bridging loan to cover its funding needs until September at the meeting, and will also offer new economic reforms to replace some of the previous government’s austerity measures. In response, the Greece Solidarity Campaign, Syriza London and other organizations have called for an “emergency protest” titled “Let Greece Breathe” in support of the anti-austerity movement in Greece on Wednesday at 6:30 pm in London’s Parliament Square. A second central London protest will be held in Trafalgar Square on Sunday afternoon.